You have to start somewhere in your search for exceptional and distinct single origin coffee. In my case, the first trip to origin was to El Salvador in May of 2018. This is where I met people with similar passions for coffee, and an excitement to discover something new and delicious. 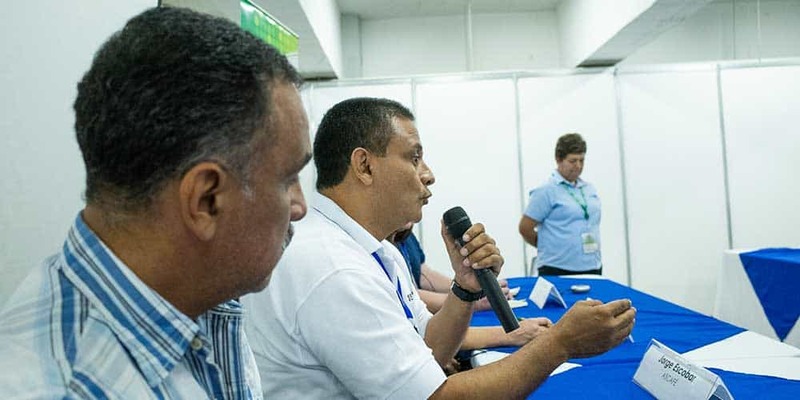 I flew to El Salvador to participate in a coffee event funded by the USDA, along with the National Cooperative Business Association/Cooperative League of the USA (NCBA CLUSA). 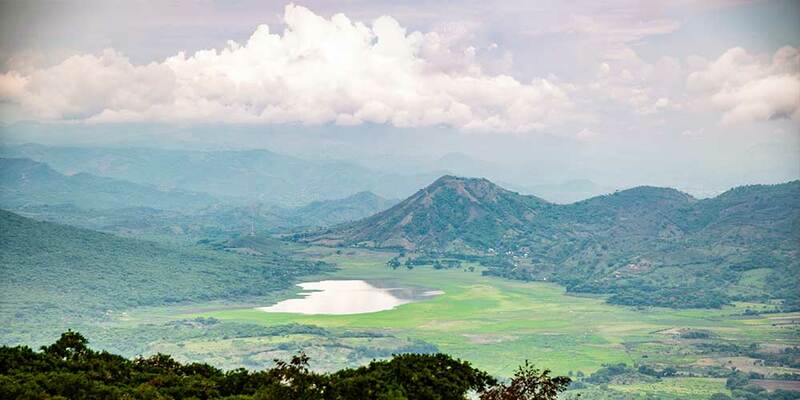 The stated goal of NCBA CLUSA in El Salvador is to work with coffee farmers to help them rehabilitate their farms after a devastating rust epidemic, and in turn educate them on more environmentally friendly ways of farming and Organic options. 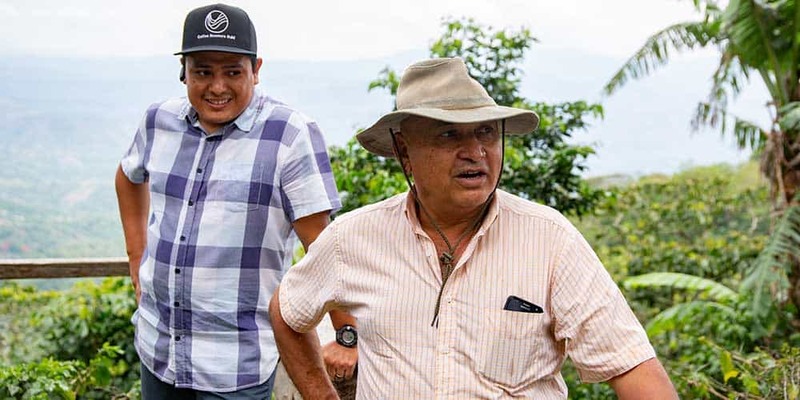 NCBA CLUSA in El Salvador has also partnered with the El Salvadorian government to pull together all efforts to support local coffee farms and coffee businesses throughout the country. Climbing the dirt road up to the top of Finca Monte Verde in El Salvador. There are no established roads on the farm so a 4 wheel vehicle is a necessity. I’ve never been to El Salvador but I knew that it was dangerous place, specifically San Salvador where I was staying. Though I was cautious I didn’t feel unsafe. If you decide to travel to El Salvador, or any country with a high crime rate, it makes sense to know who will pick you up at the airport. Get their name and even a photo if possible. In addition, if you know anybody who is from the area that can take you around, even better. 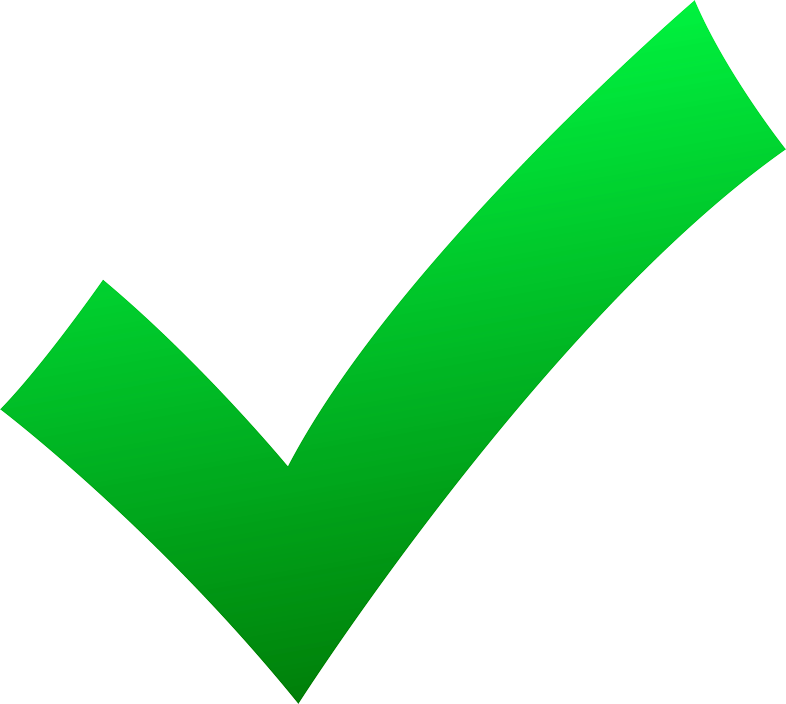 Knowing the places to avoid and what might look suspicious is key to having a safe and enjoyable trip. In my case I was lucky to have my friend Ben Argueta who happened to live right near my hotel. I had purchased some coffee from Ben’s family farm many years before and it was some of the best I’d tasted in a while. Unfortunately over the last few years Ben’s farm was hit with rust and decimated his crop to the tune of at least 70%. Because of that he’s had to slash most of his bushes and is unable to sell his coffee outside of El Salvador. For those farmers how were lucky to avoid rust disasters, specialty single origin coffee is totally abundant in El Salvador, you just have to know where to go. One of the first things Ben did was take me to a well known cafe called 3 Monkeys. 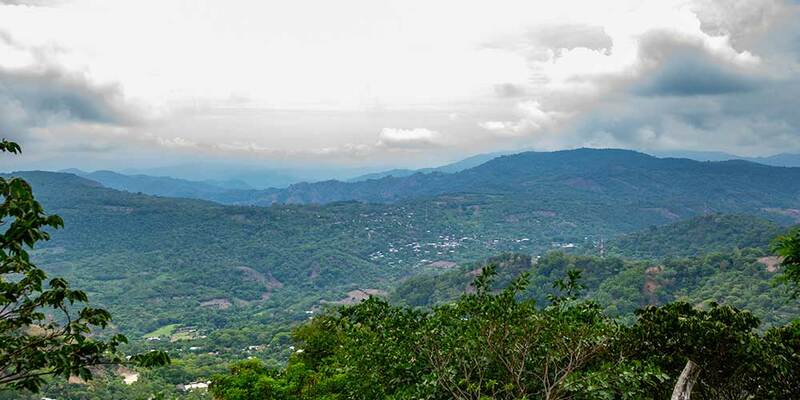 3 Monkeys is owned by barista champions, and we ordered two delicious cups of coffee while looking out at the mountains that surround San Salvador. The next day our group of three American and two South Korean representatives started a two day, 40+ coffee cupping session. 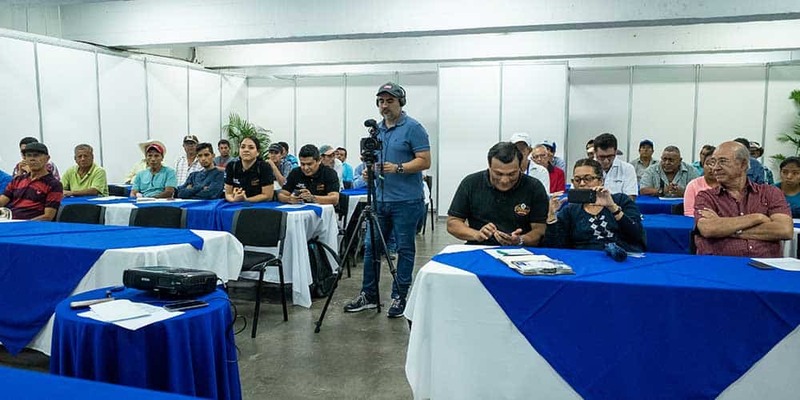 The organization NCBA CLUSA El Salvador along with the USDA organized the event that was taking place at a local agricultural fair. As a small group we were there to cup a variety of pre-selected single origin coffees from farms throughout the country. After each round of cupping our group sat in front of a group of farmers and coop representatives to discuss our thoughts on each coffee and answer any questions. Hearing from the organizers of the event in El Salvador from NCBA CLUSA. The farmers and coop representatives who submitted coffee samples to the event for us to cup. We tasted over 40 different single origin coffees over two day. Among the varietals were Pacas, Bourbon and Pacamara, and those coffees were either washed, honey or naturals. 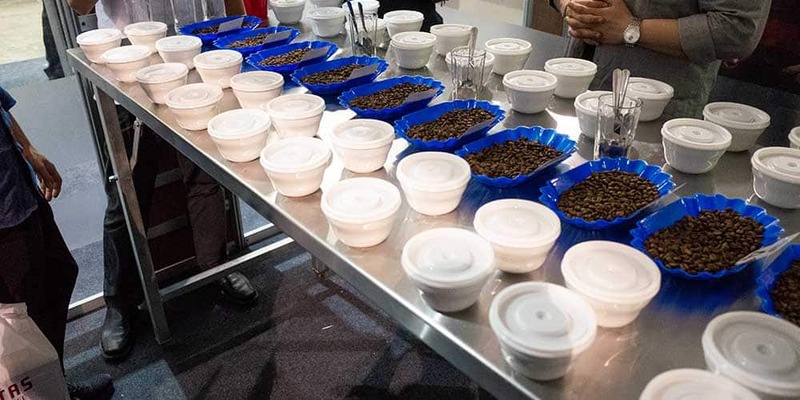 After each round of tastings we would sit as a panel in front of the farmers, coop representatives or family members and go through our thoughts on each coffee. We answered any questions they had and tried to be as open and honest about our likes and dislikes in their coffees. This as you can imagine is never easy, telling a person who’s worked so hard that their coffee might have an issue or something about it that just wasn’t as pleasant. Luckily, this was a rare occurrence. Most of the single origin coffees we tasted were absolutely delicious and really represented the coffee from El Salvador well. We tasted over 40 different coffees Thursday and Friday. 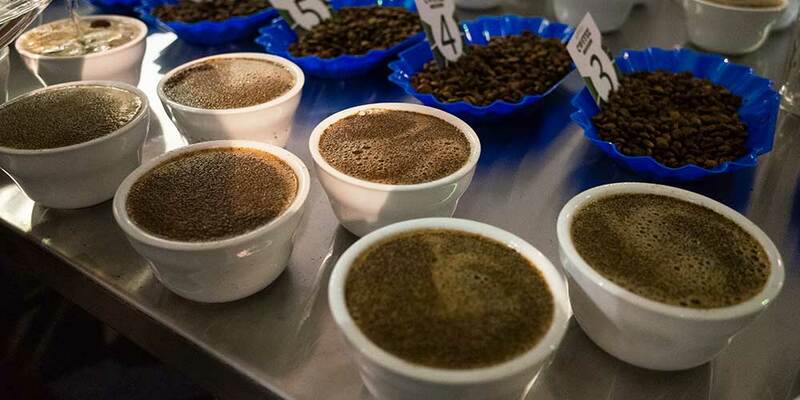 After each round of cupping we sat in front of the farms and representatives of each coffee to discuss our thoughts. Getting ready to cup through the samples of the day. We did two rounds of sampling per day. The next day German Zelayandia picked us up and acted as our guide throughout the day. German’s father-in-law is Rene Contreras, the patron of Finca Monte Verde, our first stop. German and his wife Hilda Contreras de Zelayandia were representing her families coffee at the event, and we thought their honey and natural processed coffees were some of the best on the table. Currently German and Hilda only work part time on the farm, and commute from their home in San Salvador where German works in IT and Hilda is a practicing medical doctor like her mother. Both are interested in moving to the farm with their young daughter to work in coffee full time. German has traveled to Costa Rica to learn more about coffee farming and new organic processes and is very interested in how modern technology and farming practices can be implemented on the farm. German and his father-in-law Rene Contreras on Finca Monte Verde in El Salvador. Climbing the dirt road up to the top of Finca Monte Verde in El Salvador. 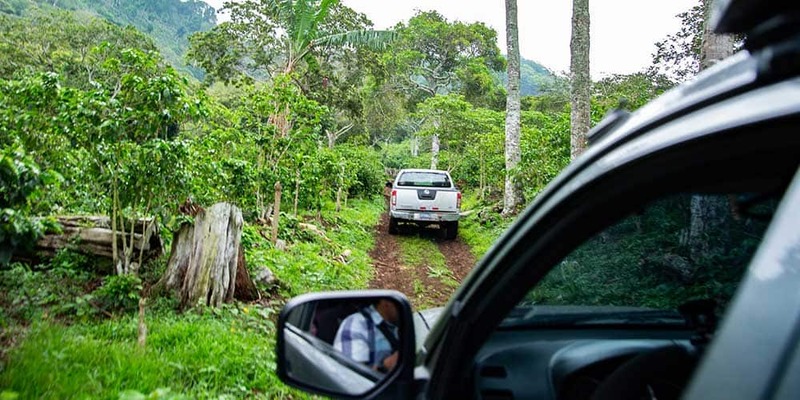 On the farms there are no paved roads so you absolutely need a four wheel drive vehicle to get up to the coffee. Monte Verde has been in the Contreras family for over 100 years. As surrounding farms have shut down Rene has snapped them up to increase their capabilities. From the top the mountain you can see across a large valley, and we were so close to the border that my phone messaged, “Welcome to Guatemala.” The view is spectacular and breathtaking, and you can see the El Chingo volcano looming out in the distance. The Contreras family has made it their mission to produce not only great single origin coffee from El Salvador, but great coffee in general. In addition, they appreciate the hard work their farm hands do on a daily basis. To that end they have made it their mission to develop a working environment that enables and elevates their employees and their families. Unlike many farms in El Salvador that use temporary migrant farm hands to pick cherries and process the coffee, Finca Monte Verde is staffed year-around. In addition, Hilda and her mother offer medical services to anyone in need on the farm and in the village at the foot of their property. 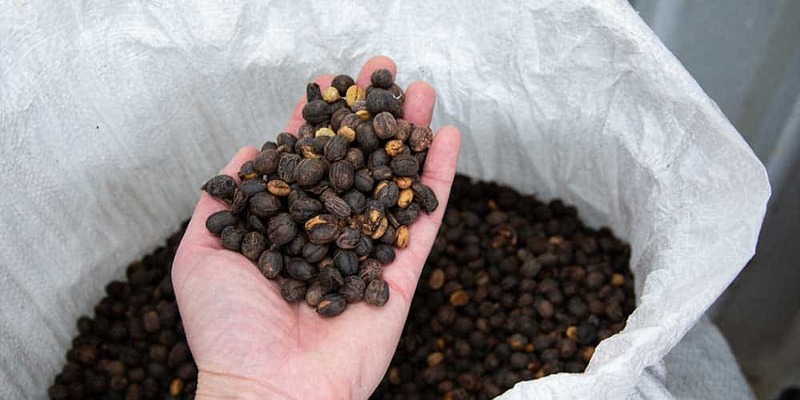 The Monte Verde single origin coffee is well developed and processed. They take great pride in their picking and sorting methods to maintain quality control through the entire process. I was lucky enough to purchase bags from both their San Rafael Natural and Los Cipreses Honey. The San Rafael Natural is a wonderfully delicious coffee that has a familiar flavor but stuffed deep inside a cup of coffee. You can taste toasted nuts like peanut butter and a deep flavor of strawberry jelly. It’s your 10 year old self’s lunch in a grown up form. The Los Cipreses Honey on the other hand is sweet and crisp with a rich body. It’s not fruity like the natural because of it’s processing, but you do get a slight hint of fruit and citrus in the background. Natural processed coffee from Finca Monte Verde. 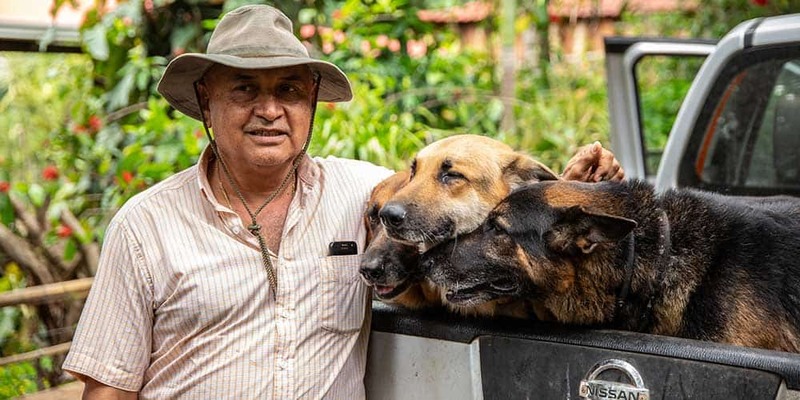 Rene Contreras and his dogs on Finca Monte Verde. Try some of Finca Monte Verde’s coffee and let us know your thoughts. 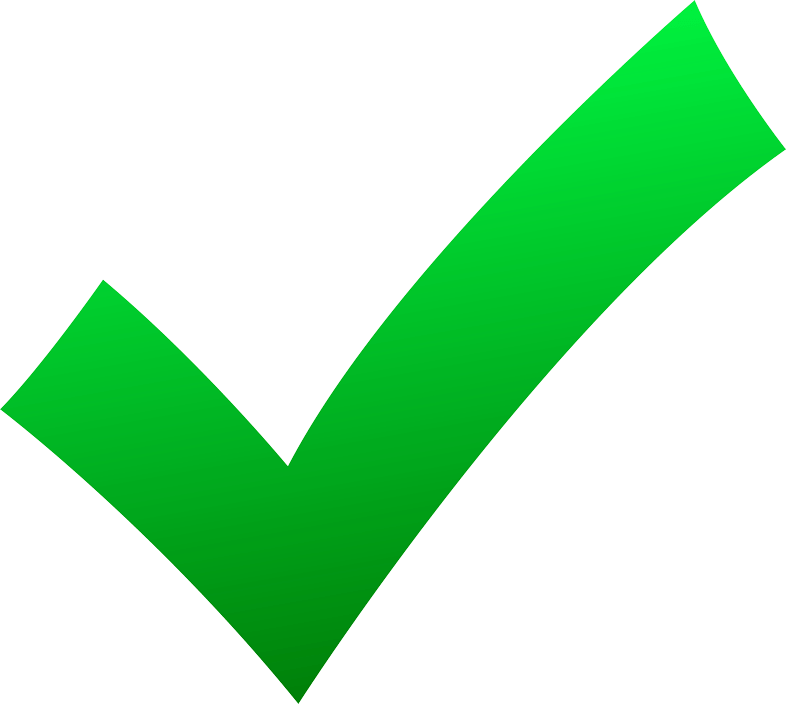 This entry was posted in Sourcing Trips and tagged coffee, coffee farm, coffee sourcing, cupping, direct trade, el salvador, green coffee, monte verde, ncba clusa, relationships, san salvador, sourcing, traveling. I’ve grown up in a family where my father came home smelling like roasted coffee each day. That memory has informed what I do here at Path and I’m excited to share my joy of coffee with you.